The Siegel Group Nevada Inc. has been building its multifamily empire in Las Vegas for more than a decade. Its model of easy rental terms and turnkey move-ins, along with other offerings, have allowed the organization to amass more than 20 apartment communities in the Las Vegas Valley. Stephen Siegel, CEO and founder of Siegel Group Nevada Inc., maintains a second-floor office at the company's headquarters, near Paradise Road and Twain Avenue. (Courtesy photo). Stephen Siegel, founder and CEO of The Siegel Group Nevada, a real estate investment and management company, dubbed his model the “apartment building solution.” Potential residents can move in without having to do things such as put utilities in their name or having to go rent or purchase large items like furniture, he said. “Someone can come with their toothbrush and their clothes and move in now and figure out what they want to do, and a lot of people end up staying with us for a long time because we have such great locations, and we’re close to everything,” said Siegel. The concept has pushed the Siegel Suites brand — filled with a demographic that runs the gamut from construction workers, cab drivers and black jack dealers to retirees and veterans — across the valley, from downtown Las Vegas to North Las Vegas and areas around the Strip and along Boulder Highway. Siegel brings a long history in the acquisition, disposition and repositioning of underperforming, value-added real estate such as multifamily, extended-stay, hotel-casino and other asset classes, along with other businesses. But he didn’t initially come to Las Vegas for that purpose. 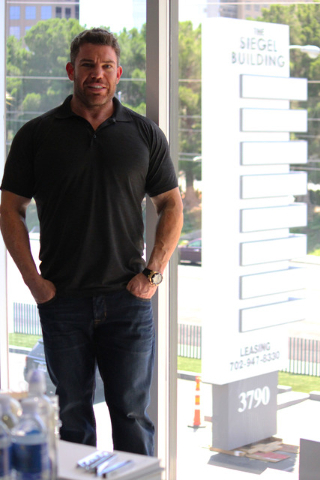 Siegel started out in California in real estate and repositioning businesses. During his success in other ventures, he began to invest in multifamily and retail properties in Los Angeles, renovating, stabilizing and selling them. The cost of real estate, however, started to rise in California in the 2000s, and Siegel went on the hunt for another potential region to target. Las Vegas looked good to him, he said. In 2004, Siegel marked his entrance into the valley with the acquisition of a 132-unit apartment complex, known as Vista Arms Apartments, on the northwest corner of Sierra Vista Drive and Swenson Street. At the time, Vista Arms was using a weekly and monthly model, which Siegel said was foreign to him at the time. Siegel said he converted Vista Arms into a traditional apartment complex. He later sold the property to the Las Vegas Convention Center. The site is now a substation for the Las Vegas Metropolitan Police Department. As Siegel spent more time in the city, his concept started to take shape. Siegel’s “solution,” which he eventually started doing in the city in 2006, has been successful. “We have about 10,000 units, with a majority of them in Las Vegas, and we have about 90 percent occupancy,” said Siegel. Las Vegas’ total vacancy rate in the first quarter, as marked by UNLV’s Lied Institute for Real Estate Studies’ Apartment Market Trends report, was 8 percent. Siegel described his model as distinct from the way other properties operate. “It’s not a weekly model,” Siegel said. Siegel said many people mistake some of their properties for a motel, but they’re apartments, not a motel, he said. Tenants can come in and get amenities such as cable and fully furnished rooms, along with the flexibility of being able to pay by the week, though the properties don’t rent by the week, Siegel said. Siegel has an option for those looking for an extended-stay hotel, known as the Siegel Suites Select. There are three of this version, which tries to attract business travelers or professionals, at various locations around town: one near Desert Springs Hospital on East Flamingo; another at Las Vegas Boulevard and Warm Springs Road; and a Rodeway Inn, under redevelopment on Convention Center Drive near the Strip. That property recently was purchased by Siegel and is still operating during its rebranding. Siegel also has ventured into other aspects of ownership in the valley with the purchase of the Gold Spike, which later was sold to the Downtown Project. Other ventures include the boutique hotel, Rumor, across from the Hard Rock Hotel and Casino, The Resort on Mount Charleston and the Artisan. He also owns industrial and retail properties in the city. But Siegel said his focus is the company’s multifamily projects. The group, which also has offices in California, is headquartered near Twain Avenue and Paradise Road in a recently renovated 36,000-square foot complex. Siegel has a large footprint in the area, owning basically the whole block behind the headquarters. Siegel said he also owns two bars and a retail building in the area. Once a California-based entity, Siegel said he considers himself a Nevada resident after moving to the area in 2007. Siegel also has high aspirations for the city. “I think Las Vegas still has a lot more room to grow,” he said. The company has also spread its wings into Reno, where Siegel said he is likely the city’s biggest apartment owner. “We’ve grown tremendously over the last two or three years in downtown Reno,” said Michael Crandall, senior vice president at The Siegel Group. The group, which has approximately 1,300 employees, also holds properties in California, Arizona and most recently New Mexico.